Mini Italian-style chicken meatballs cooked in one pot with flavorful chicken broth, pasta, and kale for an easy weeknight dinner. 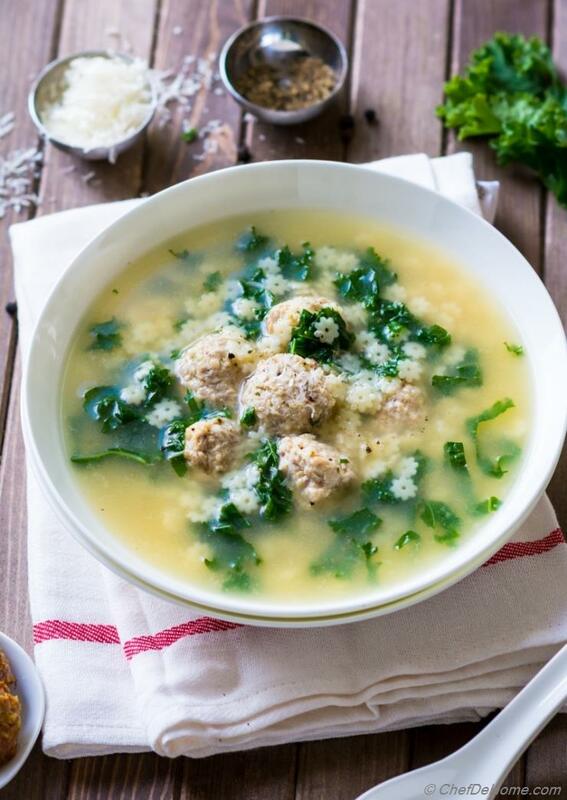 Flavorful and hearty Italian wedding soup with meatballs, pasta and kale.. all cooked in one pot for an easy winter meal. Why Wedding Soup? Well, no, I'm not hosting a wedding party.. but a comforting winter soup such as Italian Wedding Soup with pasta does not need a special occasion! Don't you think?! Actually, you know what? History says, this soup is not even served at Italian Weddings! Go, figure! The Italian Wedding Soup recipe is inspired from an array of Italian soups famous world-wide such as minestrone soup, Italian pasta soup etc. Only prep required for this soup is mixing ground chicken and seasonings, and scooping the meatballs. Rest of the soup comes together very fast because even meatballs are cooked in flavorful soup broth. I even cooked pasta in same broth which makes it an easy one-pot meal! Pasta also gives little velvety thickness to the soup which is my personal favorite! 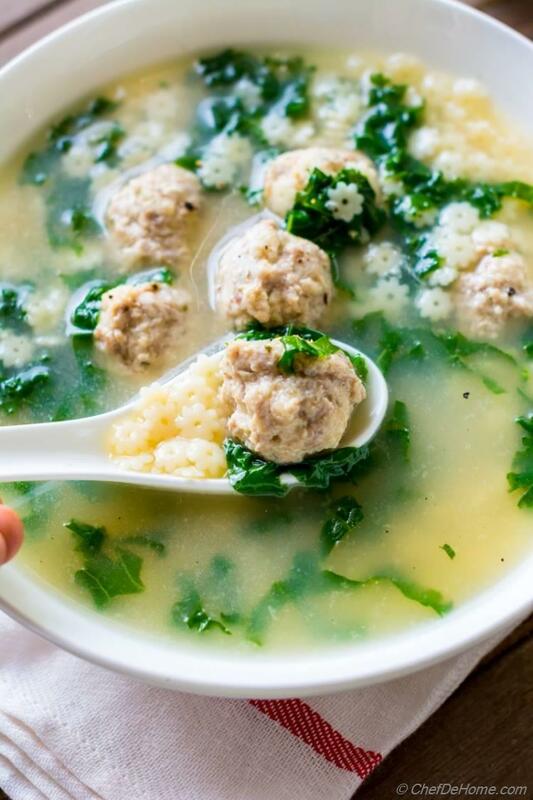 My version of wedding soup is loaded with mini chicken meatballs. 80% of the time my family prefers chicken over any other meat...so I decided to use chicken for this recipe. Turkey or lamb gets the rest of votes but today we were in mood of chicken dinner (surprise surprise). 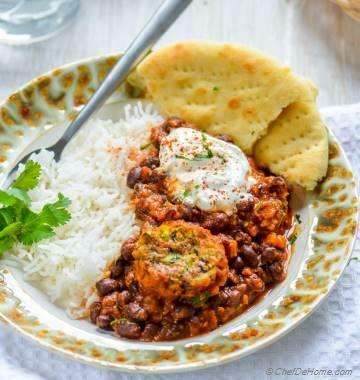 What I am saying is; don't get stuck because of chicken, you can even use ground turkey or lamb for this recipe. 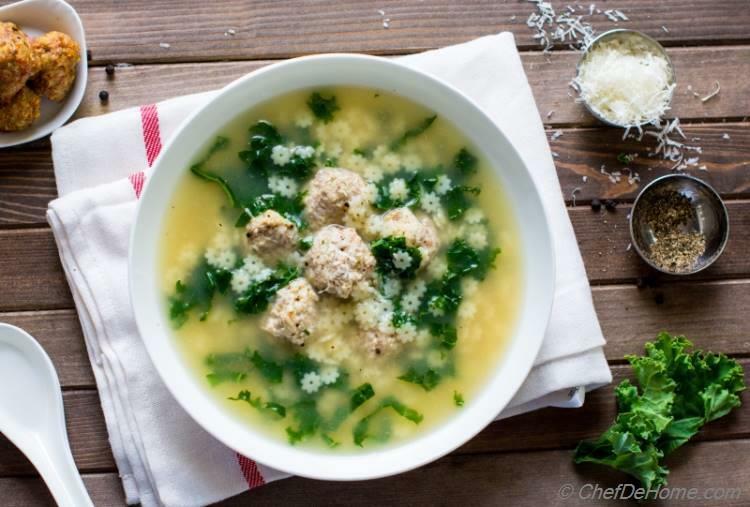 There are 3 main ingredients that make a perfect Italian Wedding Soup. 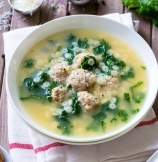 For me, meatballs are star of this soup. I like to add lots of flavor in meatballs so that we enjoy every spoonful. I follow a set of simple steps to ensure meatballs are moist and juicy. I recently shared these steps in my Italian Meatballs recipe. Another important ingredient in wedding soup is Chicken Stock. Since recipe is so simple, I highly recommend using good quality, preferably homemade, chicken stock. 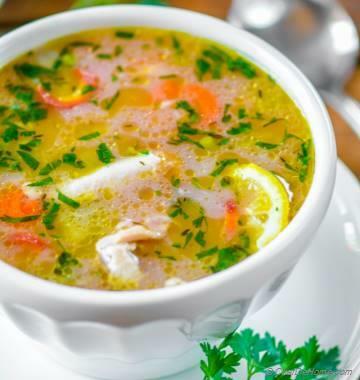 I have used homemade chicken bone broth which really made this soup double-delicious. Is that even a word? "double delicious"
You know what I mean, right?! Scrumptious, perfect, delicious, crazy tasty!! I have used very small, star-shaped pasta which I add almost half way through cooking. If I was using regular pasta such as penne or farfalle, I would add it with meatballs so it cooks by the time meatballs are ready. Traditionally, Italian soup is made with spinach. Using kale instead of spinach was totally my personal preference. I find the texture of stewed kale almost like stewed mustard greens, chewy with some bite that I enjoy with bite of meatball and pasta. Spinach on other hand melts in the soup but if you prefer flavor of spinach, please feel free to swap. To freeze meatballs, I roll all of them at once while getting ready to make Italian Wedding Soup and place them spaced-apart on sheet tray lined with parchment. Once all are rolled, I drop as much as I want in broth for soup and put the sheet tray, with remaining meatballs, in freezer. In 2-3 hours, meatballs become snow cubes. Then, I add those to ziploc bag and freeze for later use. Not just wedding soup, these also go into my meatball penne pasta. Recipe of Italian wedding soup is adapted from two of my favorite food network cooks - Giada and Ina Garten. There are million variations of this soup, but I liked clean flavor approach in these two recipes. I loved Giada's idea to cook meatballs in the soup. From, Ina Garten's version of Italian wedding soup, I adapted use of celery, carrots and onion mirepoix to flavor the soup base. Simple saute of these three aromatics really does magic to clean chicken broth. It seemed unfair to credit one of two, so I'm crediting both for this bowl of deliciousness. 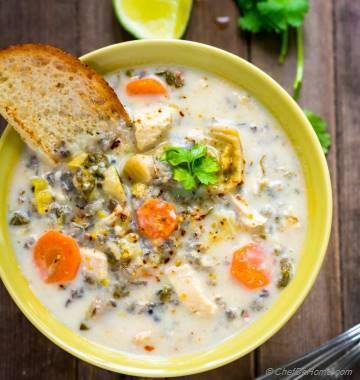 This soup has sure made place in my weeknight menu. By freezing few portions, I even stretch the dollars/time for weeknight meal. 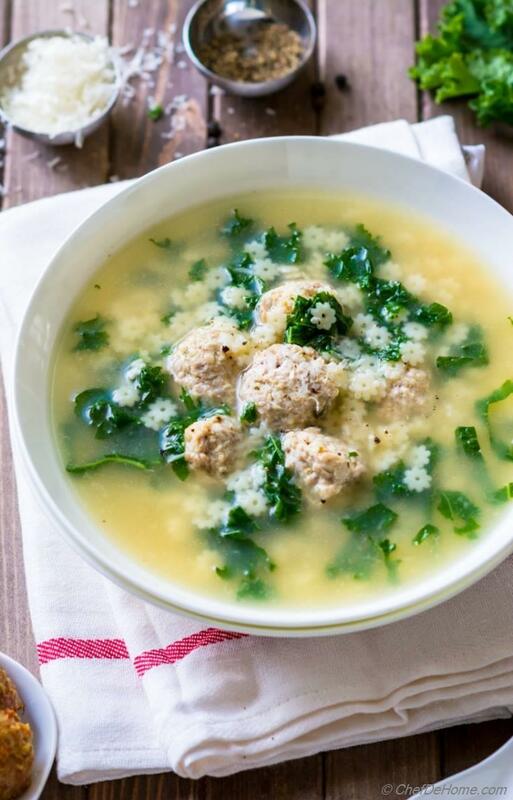 Now you know, Italian Wedding soup is not for Italian weddings and is super easy to make at home, any day, all in one pot! So make some tonight and enjoy! Smart Swap For variation, replace chicken with turkey! 2. In a wide bowl, add breadcrumbs and milk. Mix and set aside. 3. In a food processor, add onion, garlic and parsly and pulse until fine chopped. Add to a bowl with egg, cheese, and chili flakes in bowl with breadcrumbs. Add ground chicken and mix to distribute the seasonings. Scoop mixture with 1 inch ice-cream scoop or a tablespoon and place on baking sheet. 1 lb chicken yields 28-30 meatballs. Follow instructions from notes to freeze half of meatballs for later. 5. Ladle soup in serving bowls, add Parmesan (optional). Serve and enjoy. 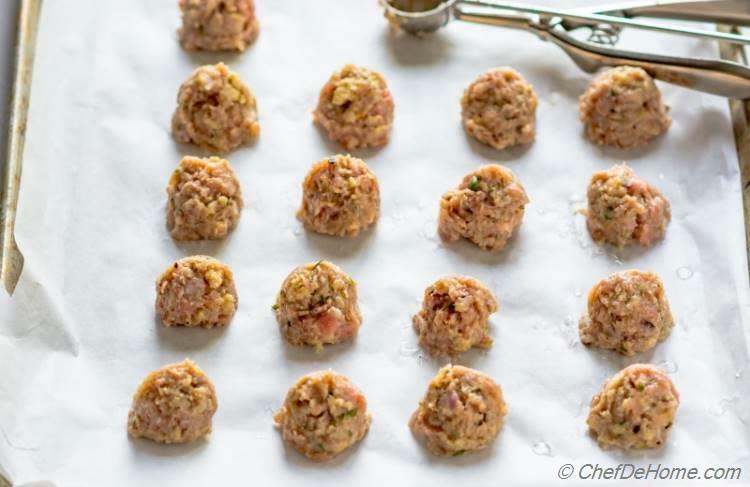 Freeze Meatballs for Next Time: To freeze meatballs, scoop and place them spaced-apart on sheet tray lined with parchment. Place the sheet tray with meatballs in freezer. In 2-3 hours, meatballs freeze fully. Then, add to reseal-able bag and freeze for later use.